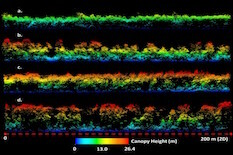 A team of scientists from the University of Maryland and Sigma Space Corporation has shown that 3-D forest structure and topography can be measured rapidly, efficiently and accurately over large areas, using an innovative laser technology called single photon lidar (SPL). The study, funded by NASA and published in the Nature journal, Scientific Reports, evaluates the first large-scale deployment of a single photon lidar instrument over the entirety of Garrett County (1700 sq. km) in Maryland. The instrument developed by Sigma Space uses an array of lasers to illuminate targets on the earth’s surface and captures energy returned from these targets more efficiently than other lidar instruments. The instrument requires only one photon to make an accurate measurement of the distance or range to landscape element. Each element of the 10 x 10 detector array is able to make a simultaneous measurement at any one instant. These observations are then used to map the vertical structure of the canopy, and as the instrument scans, to provide continuous spatial coverage. This is in contrast to conventional lidar, which needs hundreds to thousands of photons to make a reliable range estimate. “Forest monitoring and associated carbon inventory was one of the main applications that guided the development of these instruments. We are very pleased to see it come to fruition. Units even more powerful than the one used in this campaign have already been developed,” said Dr. Marcos Sirota, President of Sigma Space.